Chicago, Illinois- November, 1988(?) The morning after driving in from Grand Rapids, Michigan in a blinding snow storm. This is the last of seven trucks we used to pull this trailer. At this point the truck was new. We still have it (130K miles). Update on the truck- it's gone now. After a tree fell on it in the 2004 hurricanes, it still was functioning (it still ran! ), but too many small things were going wrong. I hope it has a good new home, as it was a good truck. 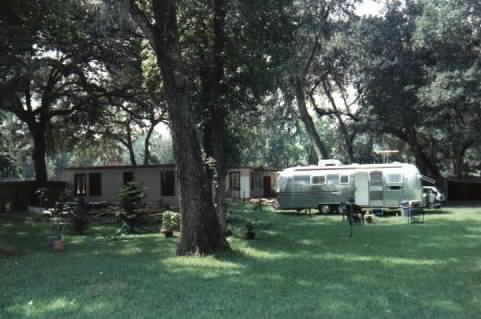 Same trailer- 1975 Airstream 31' center bath. 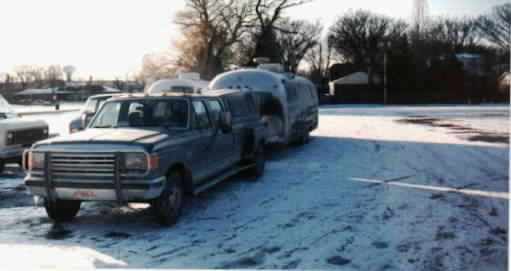 At this point, we had towed this trailer around 400,000 miles. Our friends '77 31' Excella 500 in the foreground- we're in the background- Green Bay, Wisconsin. At a college in Minnesota- argh- can't remember the name or town, but a beautiful campus. A somewhat fuzzy picture of our present Airstream- a '78 28' rear bath, double bed, side couch in the living room. 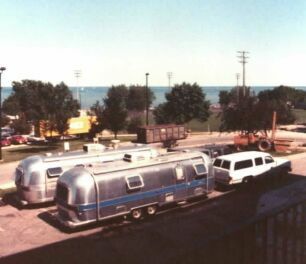 To the right is my parents HiLo trailer- unique in it's own way like an Airstream. Unlike our last trailer- we have towed this one a total of about 200 feet! In 1996, the store we had been renting since '92 was sold...but we had been wanting to move anyway- so we got busy looking for commercial property where we could work *and* live. The house was unlivable, plus needed an entire new roof- so to save time (plus we had a cash in hand buyer for our old place)- we bought this Airstream from a customer who was selling it at our place- moved it to the back yard, and set up house keeping. Two pictures with the very much under demolition and construction house in the back ground- the roof- everything above the cement block walls- has been removed, and framing has started. A funny aside about the house- built in 1951 by a man who developed the neighborhood, it was the "showplace"- but... the property was full of "cabbage palms"- not one to waste anything, he hired a person to cut and make beams out of the trees. * Airstream Trailers.com- a new online resource- a very good looking "jumping off" spot for online Airstream resources- a great starting point. 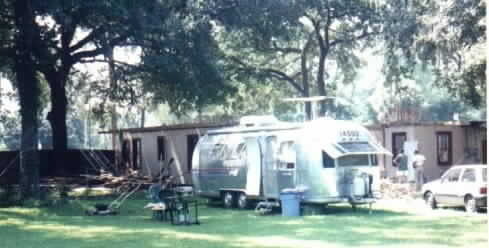 * The Vintage Airstream Club, a good web site, a great e-mail list.. Highly recommended. 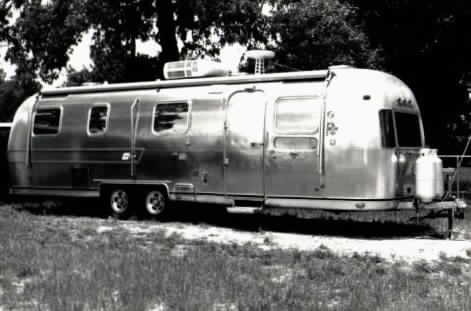 * Vintage Airstream.com- Another good web site- a lot of pictures, information, et cetera for vintage Airstreams. 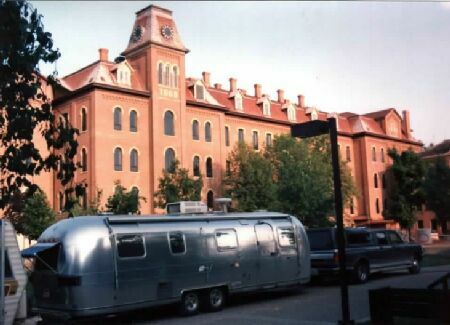 * Tom Pattersons web site- tons of good information, good pictures, plus the archives of the Vintage Airstream e-mail list. * Vintage Trailer Supply, Inc.- a good place to find those hard to find items for Airstream restoration- also good prices on Aluminum LP tanks. Formerly Known as "Airstream Dreams"
* Inland RV- A long time source for vintage Airstream parts- they have parts nobody else does. * Airstream E Mail list- Hunter Hampton's Airstream e mail list- a very active list for newer Airstream trailers and motor homes. 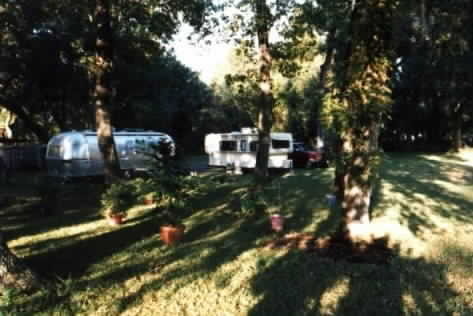 * Airstream Central- a good web site- undergoing some changes. * The Avion Guy- a new website- very well done, with information on the Airstream "first cousin"- the Avion.